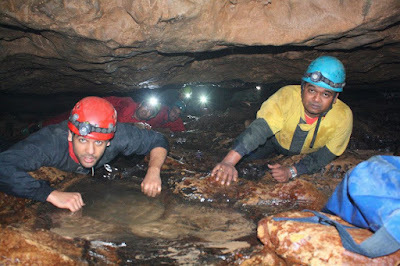 The state of Meghalaya is famous for its natural caves. 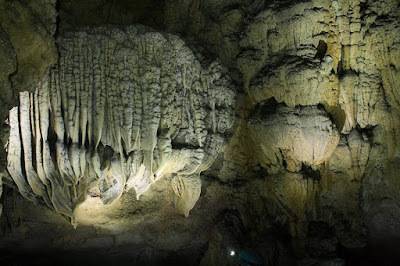 The geography of the state is dominated by high hills composed of limestone. 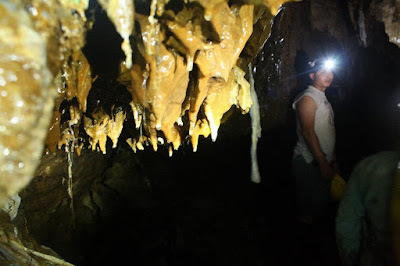 These porous hills, coupled with the heavy rainfall the region receives have led to the formation of an elaborate structure of underground caves and passageways. 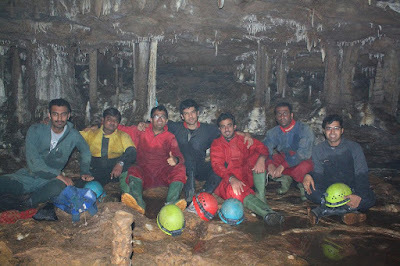 These caves are of a significant interest to the scientific community as they help them to trace the changing climatic conditions of the sub-continent. 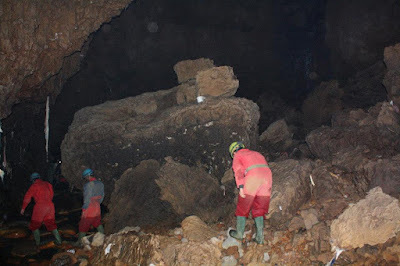 Also, the caves are rich in fossil content - mostly preliminary aquatic life-forms from the sea that existed before the merging of the Eurasian and the Gondwana plates and the subsequent rising of the hills. 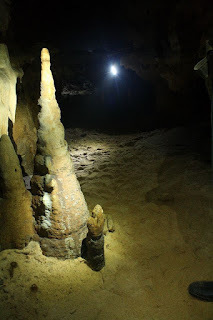 Our interest in these caves was largely pedestrian in comparison: we were to go caving (spelunking) - a sort of an underground hike exploring the various formations and geographic structures inside. 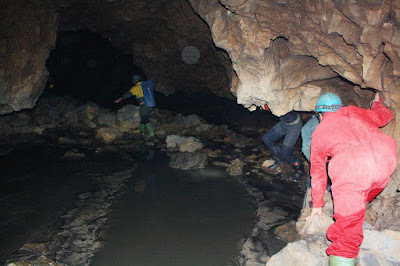 An exciting activity awaited us at Krem Mawmluh - and a terribly claustric one too! 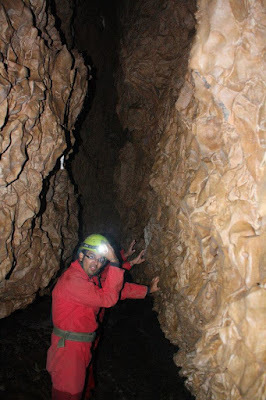 Caving is a moderately dangerous activity. 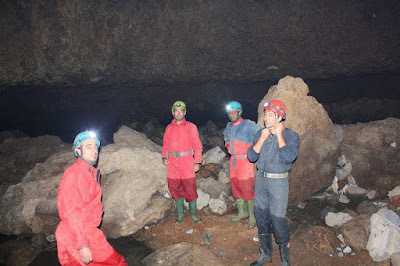 The temperatures in the caves are quite low, the trapped water-bodies are near freezing, the cave walls and floor are jagged sharp and there is absolutely zero light. 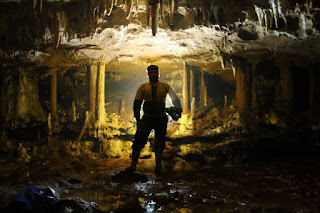 These conditions are tackled using a combined gear - a bodysuit (warmth and protection to the body), helmet with head-torch (obvious? 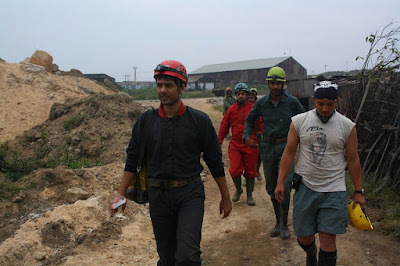 ), and wellington boots (gum-boots) - that eventually resembles that of a miner. 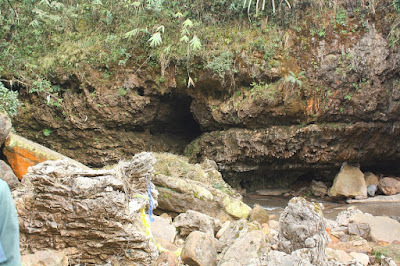 Krem Mawmluh (Krem = cave in Khasi) is located in Cherrapunji close to the factory of the Mawmluh-Cherra Cements Ltd. 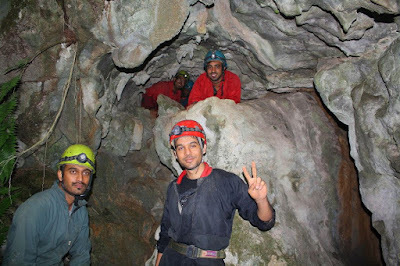 The length of this cave is about 7kms, of which we were going to cover 3kms with different entry and exit points. 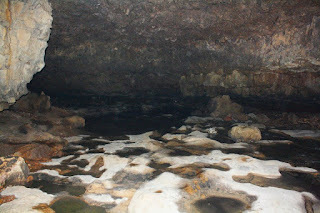 The extent of this cave is largely horizontal. 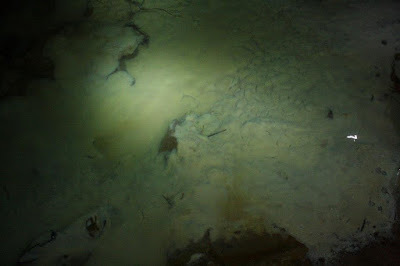 A little inside the cave we passed through a section of knee high water. The water level was just above the height of the wellingtons and I could feel the water trickle in - it's a funny feeling. 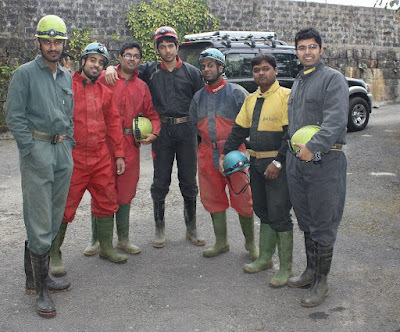 After a while, the water level completely submerge the boots. 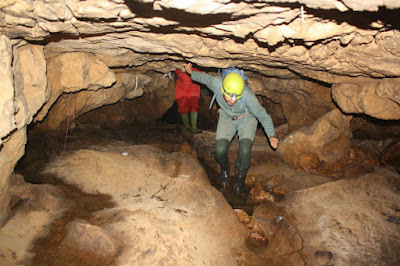 After crossing this section, we were made to do the hand-pump manoeuvre - standing up, bend the leg through the knee and twist the ankle to touch the hip - to remove the water from our boots. This is all that we did from here on for the first half of the hike. 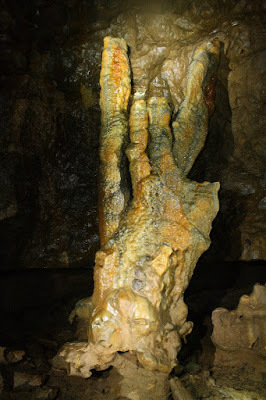 We did see a few nice formations, but more about that in the next section. Under development - trickling water shapeth! This is the highlight of Krem Mawmluh. 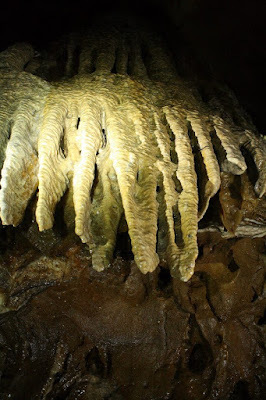 The room-like area in the cave derives its name from the numerous stalactites and stalagmites that adorn the place. They can be seen everywhere you pan your view. 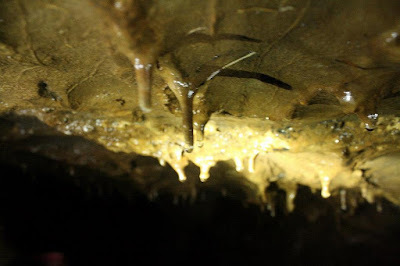 This is 'the' most beautiful sections of the cave. We had a nice photo-op here. By some beautiful coincidence, the date of this activity was 12th December, 2012, i.e. 12/12/12. 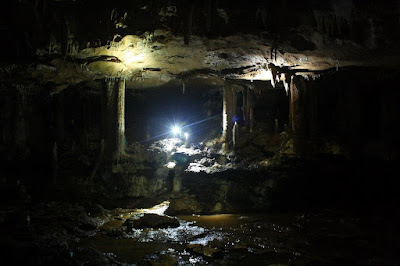 At exactly 12:12hrs our guide, Kyrmen, made us all sit in different corners of the Hanging Garden and then one-by-one asked us to shut off our torches. Everyone did as told. The result was astounding! 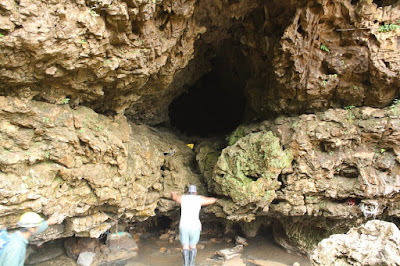 The cave was dark, without any source of light - the darkness was so heavy, I could feel my pupils dilate ... and then stretch to let in any ray of light that existed, but no - nothing! This was purely epic! Krem Mawmluh is located quite close to the precincts of the Mawmluh-Cherra Cements Ltd. 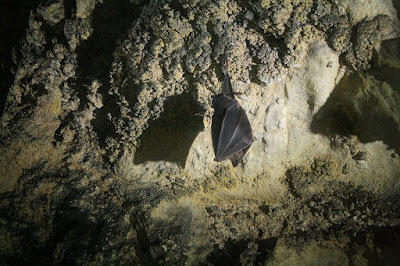 The incessant blasting for the cement works has had quite an impact on the cave - a portion has caved in already. 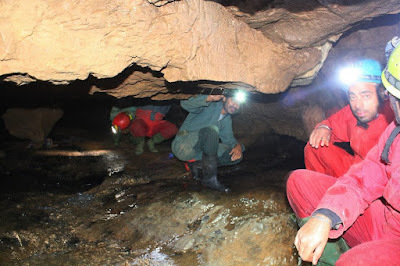 The cave is not expected to last long against this onslaught. 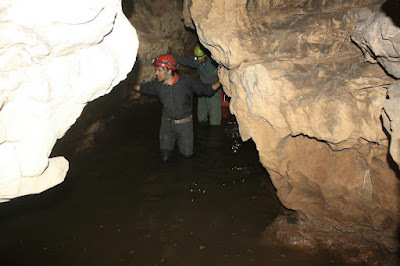 The cave also functions as a drain for the excess rain water of Cherrapunji. 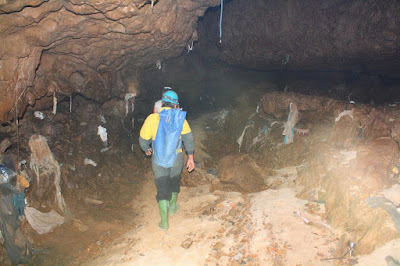 This water, of course, carries with it some of the city's finest trash - displayed not-so-proudly in a few sections of the cave. 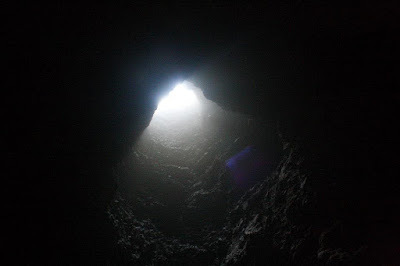 The way back up to the figurative 'light at the end of the tunnel' was again through a 20ft crawlspace, followed by a trek back to the start point. 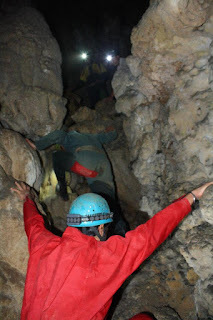 This was the time that we realized that instead of descending down a cave, we had actually ascended to a higher level. The trek back went downhill from that moment - only literally though. The exit from darkness to light is simple phenomenal ... its like a form of self-awakening for want of a better expression. 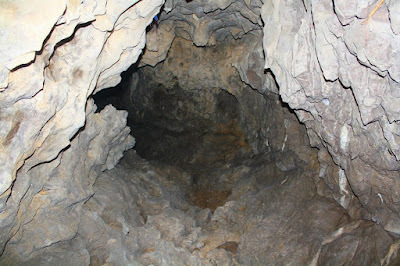 Meghalaya has abundance of caves, more so in the eastern Jaintia Hills district. 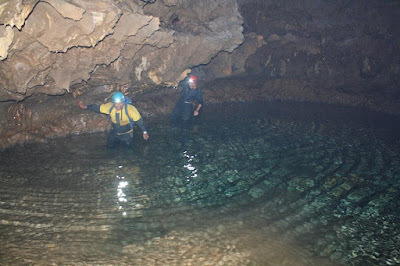 The caves are simply spectacular and a treasure-trove for an adventure enthusiast. 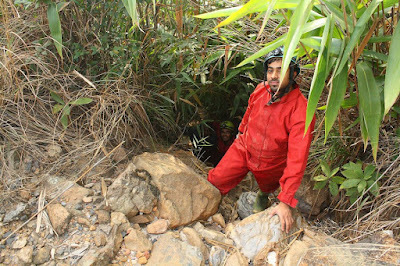 The thrill-seeker locals of the state also make this a super experience for everyone willing to undergo that bit of claustrophobia - for kicks! Best wishes to everyone involved in the sport and the conservation efforts!